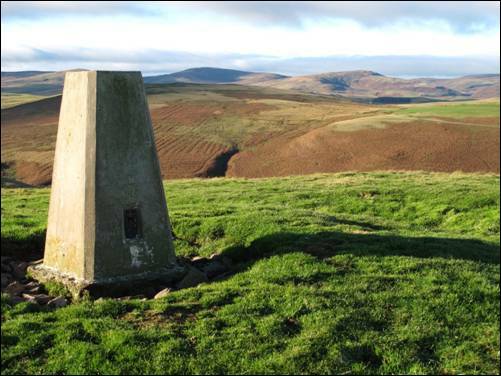 The upland area surrounding the Breamish Valley, a favourite picnic destination for generations of Tyneside families, is one of the most important archaeological landscapes in northern England. The small, attractive hills are peppered with the remnants of prehistoric hillforts, Bronze Age burial cairns and ancient cultivation terraces. The previous winter, with the hills cloaked in snow, I had walked the popular Hillforts Trail. Now, on as fine a November day as I could possibly ask for, I was off to explore a handful of the neighbouring hills. Once through the pretty hamlet of Ingram, I crossed the tiny trickle of the Fawdon Burn and headed to the billiard table-green summit of the turf-covered East Hill. Whilst the current Ordnance Survey map indicates that this top is home to a hang gliding club there was no evidence of any winged activity, of the human kind at least, from this neat little hill. The pocket-sized walker`s cairn seemed an unnecessary intrusion. I descended to Fawdon, nothing more than a cluster of farm buildings and a scattered assortment of `discarded` machinery and equipment, then followed a clear public footpath across the lower slopes of West Hill. The perfectly-conical Gibb`s Hill, a mere 250 metres high in its bare feet and just off my intended route, looked exceedingly tempting. Uncharacteristically, I resisted and headed steeply uphill to the triangulation pillar-embellished summit of Old Fawdon Hill and the site of an Iron Age hillfort. The views from the grass-covered topknot were extensive with those across the deep cleft of Fawdon Dean to the bracken-brown slopes of Cochrane Pike particularly impressive. After digitally recording my first ever visit to this splendid 315 metre high hill, I made my way downwards towards the winding green track which would eventually lead me past the Thieves Road Plantation to my next objective, the flat-topped Lumsden Hill. With little to distinguish this stretch of rough grassland from its immediate surroundings, this is a hill in name only and one purely for the record. After duly noting my visit for posterity, I followed the nearby dry stone wall to Cochrane Pike and the highest point of my outing. The widescreen panorama, stretching from the Cheviot heartland to the brooding Simonside Hills, would normally have been the perfect finale to a splendid day`s walk. But there was still the prominent Wether Hill to visit. Little more than the toss of a coin away and capped with yet another hillfort this, the fifth top of the day, was quickly in the bag and I was soon sauntering back to the valley on an aimlessly wandering track. As I reached Ingram, dozing in the weak late autumn sun, I just had to take a peep at the tree-enclosed, part-medieval Church of St. Michael. It was picture-perfect.